Her latest project is an audio tour through the Mexico Pavilion available on CD and at CD Baby. As seen on WDW Magazine! Krista can be heard on Randy Crane’s Stories of the Magic – Episodes 98 and 99! Requests for reviews, promotions, guest writing, or site statistics may be directed to disneyways@disneyways.com. Krista is most easily reached on Twitter Instagram and Facebook. and the Gluten and Diary Free WDW newsletter. She was also a contributor to ChipandCo.com. She has also partnered on facebook live video shoots and more for WDW Magazine. She had a blast growing and improving her skills with this show, but is thankful for the chance to enjoy new beginnings! Information and updates posted at her new facebook page dedicated to Disney fans HERE. Krista was featured and interviewed as one of the people “shaping Orlando’s community”on Episode 7 of the Orlando Water Hole Podcast. Show host Ben Reed invited her back to be included as resident Disney World expert on Episode 20. 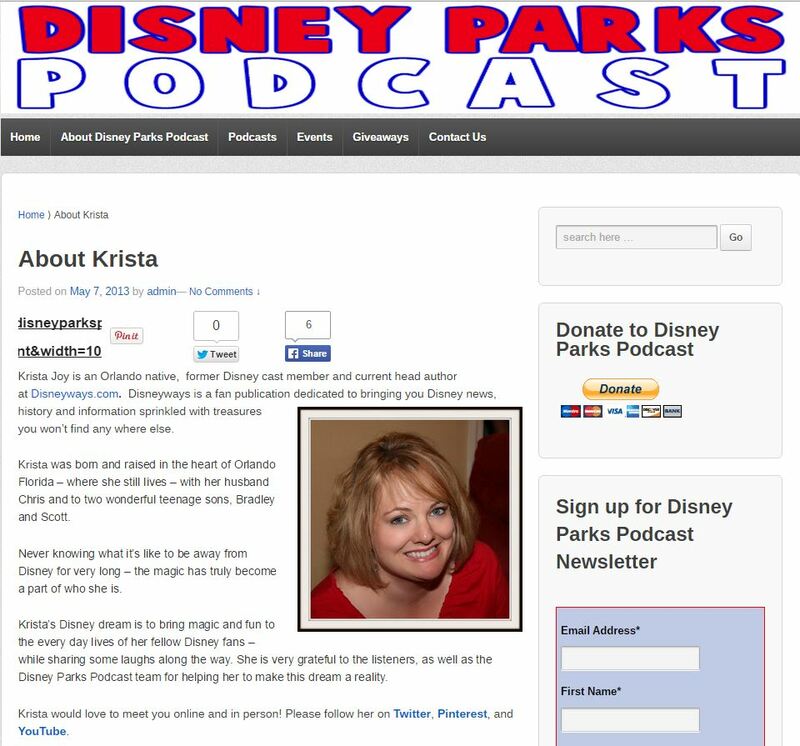 Kyle and Chris from the Wonders of the World Podcast had Krista on to discuss enjoying the parks even on those extra crowded days! Hear the recorded keynote by clicking THIS link. I have added your blog to my favorites. How often do you post? I love all things Disney. What a cute family Disney Princess blogger! Krista, this is a fabulous website! You are a bevy of magical information. Thank you for the array of ways to hear, touch and see thru Disneyways@disneyways.com and Disneyparkspodcast.com. Great success to you and all your future endeavors.